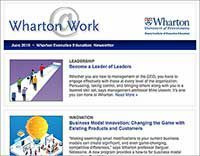 Wharton has developed numerous programs in conjunction with these associations and organizations, focusing on a wide range of industries, including finance and financial management, human resources, travel, and pharmaceutical. For more information on the Certified Employee Benefit Specialist (CEBS) Program, please visit the CEBS website. An educational partnership between Wharton and the American Bankers Association, this three-year program will arm you with the necessary leadership skill training to effectively recognize and handle high-level management issues. 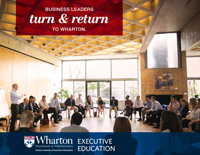 This Wharton Executive Education program is the first step of CEO Institute. This week focuses on developing an intuitive understanding of how change impacts your organization. The program concentrates on scenario planning and strategies to anticipate change and proceed proactively. This joint venture between Wharton in partnership with the International Foundation of Employee Benefit Plans, Investment Management Courses, will help you improve your investment management. This joint venture between Wharton and LIMRA International, the final component of the 20-credit LIMRA Leadership Institute Fellow (LLIF) Designation Program, will help you develop leadership capabilities to meet any challenge. The Securities Industry Institute® is recognized worldwide as the premier development program for securities industry professionals. The program focuses on helping participants broaden their perspectives, increase job effectiveness and strengthen management skills. Strengthen negotiation and decision-making skills and become a strategic partner linking human resources and business strategy. Gain a deeper understanding of the organizational challenges HR leaders face. Acquire the skills needed to become a more effective HR leader. This program covers the core concepts of business to broaden your managerial and strategic perspectives, enhance your business instincts, and sharpen your ability to tackle management challenges. It will help you work more effectively with other leaders in your organization and communicate the bottom-line impact of security decisions.